Last night I had the pleasure of doing one of my favourite poses, savasana, under the guidance of one of my favourite teachers, Brenda at Beautiful Yoga. It was extra meaningful as our lives are heading in very different geographical directions and the class was likely our last together. Brenda was my very first yin yoga teacher and one of my biggest supporters when I was considering yoga teacher training. She instilled in me a love of slow movement and further developed my appreciation for guided relaxation and a really good rest. 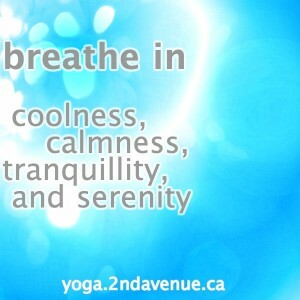 She also has an amazing voice – perfect for yoga nidra and magical for singing. Brenda’s voice often resonates in my head for days after a class and I was delighted that we chanted as part of meditation last night. My singing voice is nowhere near as magical as Brenda’s, but my speaking voice is also pretty perfect for yoga nidra! Happily, I’m doing a lovely long yoga nidra (guided relaxation) as part of the class I’m teaching tonight at Bound Lotus Meditation & Yoga Centre. 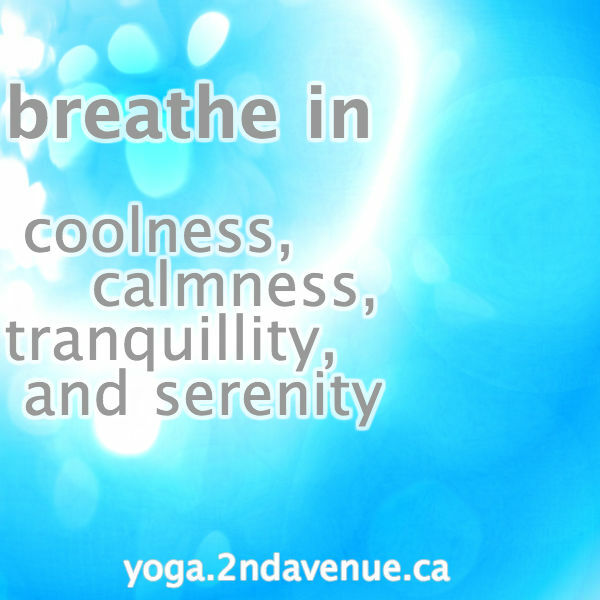 When Brenda re-awakens students from savasana (corpse pose), she often instructs us to breathe in coolness, calmness, tranquillity, and serenity. Those words frequently echo in my mind and I’ll draw on them tonight to help students leave the studio feeling blissfully relaxed. 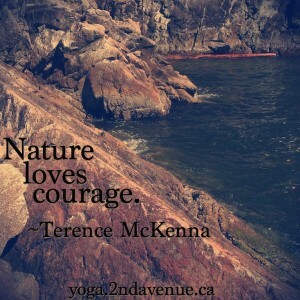 Hope you’re able to join me at 6:30pm tonight for yin yoga with extra-long relaxation! Or at the very least, that you’re able to breathe in coolness, calmness, tranquillity, and serenity wherever you find yourself this evening. There will always be impediments and obstacles. Any complicated process (like real estate transactions or renos!) will inevitably involve challenges. I’m reassuring myself that these are simply stumbling blocks, not immovable forces. 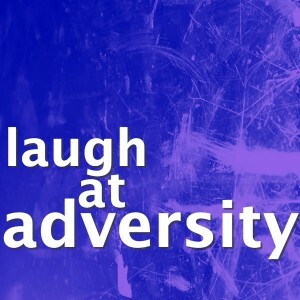 The man behind this quote has an interesting story involving lots of legal battles in the music industry. 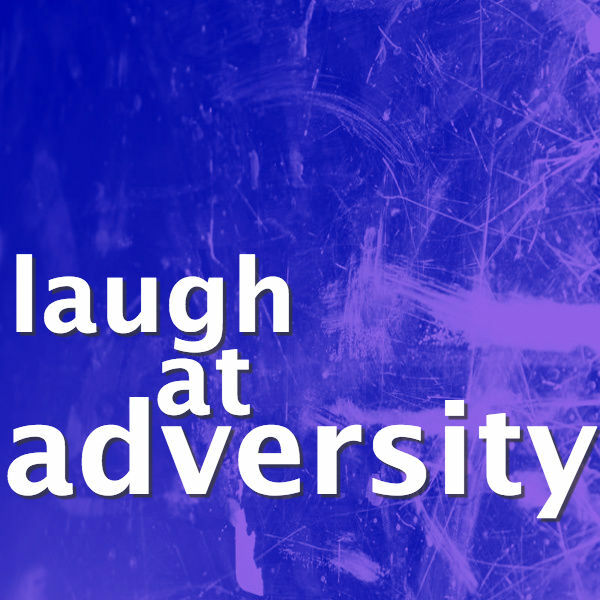 I may not want to channel his ethics (or lack thereof), but certainly the idea of laughing at adversity is a good one – ha ha! A few days ago I trepidatiously did my first downward-facing dog in over a month. The last day I did downward-facing dog or any sustained forward-folding posture, I had an extreme nose bleed. The forward-folding may have contributed to a scab from the septoplasty surgery I had three weeks prior coming off, which triggered major bleeding. 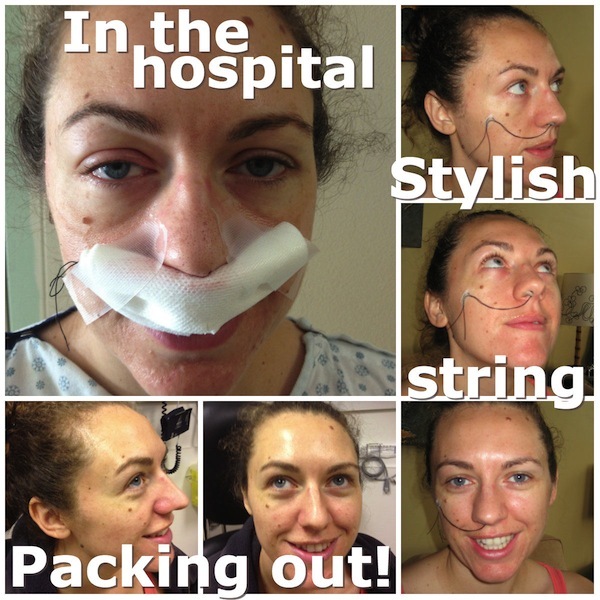 On July 29, I had blood streaming from my nose and mouth for hours – more blood than I thought possible. Thankfully, Dr Nabi (the otolaryngologist who performed my septoplasty) met me at the hospital and we were able to stop the bleeding before I required a transfusion. I was hospitalized overnight, but got to go home the next afternoon. After a night in a hospital ward, sleeping in my own bed felt incredible – even if I did have to be propped up to elevate my nose! After five days with uncomfortable packing in my right nostril, I met Dr Nabi to have him take it out. Understandably concerned that removing the packing might trigger another massive bleed, Dr Nabi took every precaution possible – none of which ended up being necessary. The packing came out smoothly and cleanly, with almost no blood at all. 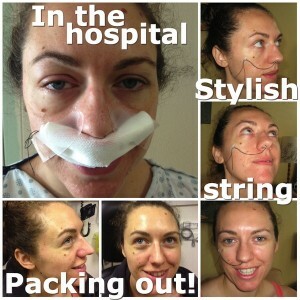 After the packing came out, recovering from the massive nose bleed was quicker and easier than recovering from surgery. While my hemoglobin levels were low and I was fighting an infection, I was in much better shape than after surgery. Eating high iron foods, taking lots of naps, and regularly rinsing my nose with saline all helped. When I last saw my surgeon, he was very impressed with the recovery and cleared me to return to regular activity – including downward-facing dog. But even after Dr Nabi’s reassurance, I was nervous about holding my head lower than my heart for any extended period of time. I’d seen my therapist and worked through the emotional trauma of the massive nose bleed, but couldn’t muster the courage to come into forward folds. I devised several yoga sequences without forward folds to ensure I could keep up my practice, but yoga without forward folding feels a little incomplete. Last Friday it finally felt like it was time. It had been over a month since my nose bleed, the nasal soreness was almost entirely gone, and I’d received a clean bill of health. Initially, downward-facing dog felt foreign and scary. I moved slowly through a sun salutation sequence, nervously approaching each repeat of downward-facing dog. By the fifth round, I felt comfortable again and was content to hang out in downward-facing dog for a couple minutes. I’m back to a full yoga practice again, forward folds and all, and have rediscovered the joy of downward-facing dog! While the septoplasty process was longer and more complicated than I anticipated, it was worth it and I’d unhesitatingly recommend Dr Nabi. He’s the first (and hopefully only!) otolaryngologist I’ve seen, but I can’t imagine a better ear, nose, and throat specialist. Hopefully, this is the end of my nose saga and now I just get to enjoy the ease of breathing through both nostrils! Whatever your plans are for the last long weekend of summer, I hope they involve a bit of relaxation. There’s often a lot of pressure to pack the Labour Day weekend full of summertime activities before the whirlwind of fall, but what about enjoying doing nothing? Find rest in the forest, in a park, at a beach, on your living room floor, maybe even on a boat. Take half an hour and just lie down. It’s not lazy or self-indulgent, it’s a recharge. 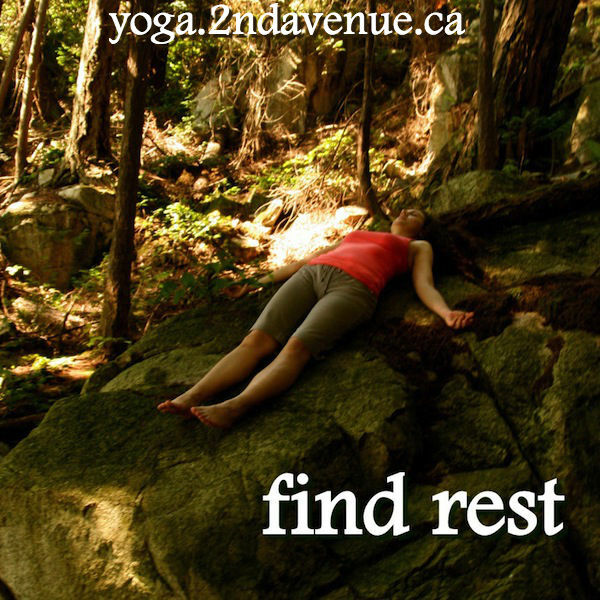 If you’re looking for an easy way to find rest this weekend, join me at Bound Lotus Meditation & Yoga Centre for a delightful end-of-the-month yin yoga class tonight. Class starts at 6:30pm and we’ll slide into savasana (corpse pose) no later than 7:10pm. During savasana, my voice leading you through relaxing every part of your body will help you find a deep, conscious state of relaxation. This ancient technique of yoga nidra (guided relaxation) encourages a sleep-like state that reduces tension, alleviates anxiety, and fosters an overall sense of well-being. Find rest over this last long weekend of the summer. Fall tends to be active and rushed; take some replenishing downtime that allows you to start your September feeling balanced and calm. You make the commitment and nature will respond to that commitment by removing impossible obstacles. Dream the impossible dream and the world will not grind you under, it will lift you up. This is the trick. This is what all these teachers and philosophers who really counted, who really touched the alchemical gold, this is what they understood. This is the shamanic dance in the waterfall. This is how magic is done. By hurling yourself into the abyss and discovering it is a feather bed. For a few summers, this time of year meant going to camp on Gambier Island. 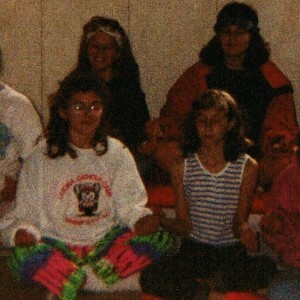 I discovered a bunch of photos from camp a while back (including the one to the right), which triggered a memory of my first exposure to yoga. One of the camp counsellors was obviously a yogi; she led the cabin in meditations and would help us prepare for sleep by doing guided relaxation. Summer campers sitting in sukasana (easy pose or cross legged) now seems a little silly (or maybe that’s a reaction to my crazy neon pants! ), but that introduction to yoga obviously sparked something. Summer camp was likely where my appreciation of yoga nidra stems from and the childhood connection is probably part of why teaching and practicing this form of guided conscious relaxation is so powerful for me. The yin yoga class I’m teaching tonight at Bound Lotus Meditation & Yoga Centre taps into that summer camp spark: a short sequence of yin poses, 20-ish minutes of guided relaxation, then a long savasana. Back-bending sphinx pose can’t help bring to mind the Great Sphinx of Giza in Egypt. I like using that enormous limestone statue as inspiration when holding the posture in a yin yoga practice: level gaze, long neck, relaxed shoulders, and unstrained stillness. Dogs are also phenomenal models for sphinx. My dog, Sofie, often flops down into sphinx to wait for the next bit of excitement to cross her path. In a yin yoga practice, the purpose of sphinx is not to bend your lower back as much as you possibly can, but to use your arms and belly to support the weight of your torso and let your back soften. It’s even better if you can convince your neck, shoulders, hips, and legs to relax as well. Resist the temptation to come into your deepest back bend; instead, find a comfortable compression through your low back. You can always intensify the posture as you sink into it. Likewise, you can always reduce the intensity if you’re getting warning signs that it’s becoming too much. The gentlest sphinx is simply resting flat on your stomach with your chin on your hands – although that’s certainly resembles the sphinx in Egypt a lot less! 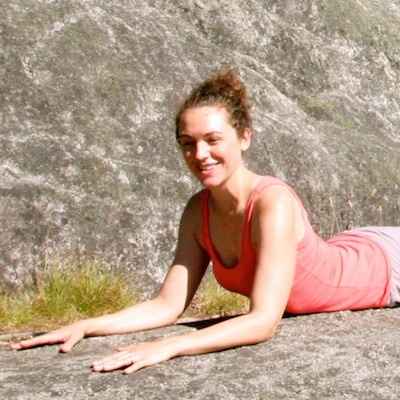 Child’s pose is good counter to release the lower back, but some people find that simply lying on their stomachs and letting their breath move to the area that was compressed in sphinx is enough to relieve low-back tension.